MADAM SPEAKER, back on October 18, I stood in this place and shared the tragic story of Jennifer Catcheway, whose parents have every reason to feel betrayed by the Prime Minister and his government. Their beautiful 18-year-old daughter had been taken from them on her birthday in 2008. She had called her mother to say that she was on her way back to her family home in Portage La Prairie and was never seen again. Nine years later, police determined it was a homicide, but no one has been arrested and her body has never been brought home for her family to bury. After years of waiting to tell their story, they were afforded just a couple of minutes at the National Inquiry into Missing and Murdered Indigenous Women. This is obviously a massive offence. The list of failures by the national inquiry is extensive, yet the Prime Minister continues to ignore the red flags or fix the process. Is this really the inquiry that he envisioned during the campaign? The goals of this inquiry are incredibly important to bring answers and some measure of closure and peace to the victims’ families and to provide a path forward for improving the lives of first nations, Métis, and Inuit women and girls, regardless of whether they live in urban centres or remote communities. The national inquiry itself is in shambles. After just four months on the job, the second executive director has quit, adding to the list of more than 20 staff members who have resigned or been fired from the inquiry since it began. This includes commissioner Marilyn Poitras, who told the CBC that the inquiry was going down the same path as so many previous inquiries and would not provide anything new to fix these issues. Then, in December, the Assembly of First Nations Special Chiefs Assembly passed a resolution calling on the Prime Minister to replace the remaining commissioners and reset the inquiry. Regional chiefs, like Kevin Hart, told the Prime Minister to address the situation right away. Francyne Joe, president of the Native Women’s Association, told APTN, “We need someone to take ownership of this national inquiry.” The response by the Prime Minister is to sit on his hands and do nothing. There is nothing to see here. The Minister of Crown-Indigenous Relations and Northern Affairs said that her government would not interfere, that it was arm’s length. They are responsible for this inquiry. Not a week goes by without the media publishing yet another failure by this inquiry. Indigenous leaders are demanding the Prime Minister follow through on his lofty words and take personal action. This was a key campaign promise of the Prime Minister. If it does not succeed in the goal of bringing both peace to families and a path forward, then it is on him and the minister. He must address these red flags and failures as a concern and ensure that the government does everything it can to get it back on track, including thePMO, the Privy Council, and the department. Canadians are asking this. Will the Prime Minister listen to the advocates, chiefs, and families of victims and get this inquiry back on track? … Madam Speaker, no one is saying that this inquiry should not continue. It now has support of all parties in the House and was a key election promise by the government. We are saying it is time for the Liberals to listen to the red flags, and respond to those red flags and the very important voices of groups such as the AFN and the Native Women’s Association of Canada. I would like to know why, in spite of the fact that there are two ministers and two parliamentary secretaries who are responsible for the indigenous file, tonight as I ask this important question again, they are not here to answer those questions. With all respect, it is time for the minister who was part of the establishment of the inquiry to listen to these flags and to take action. No this is just another example of the waste these inquiries really are. They are never on time, on budget or of any value. Simply make work projects for party cronies, retired judges and lawyers. Very true,you had nothing to say on the matter when you were in government,Now you dump on the PM,it is hardly his fault if committee members are quitting in droves. I completely agree with this presentation and I think if the PM had any intestinal fortitude, otherwise known as guts, he would take command of this blood and money sucking farce and proceed along lines that would give some satisfaction to the relatives of the unfortunate victims, however, hesitant to upset a popular applecart, he would rather make feeble jokes as he tours TWO countries, showing his socks and stuff like that, he beings us shame on a daily basis. PM Trudeau is simply not sincere in what he has to say. Good that our MP would speak up on this important matter. 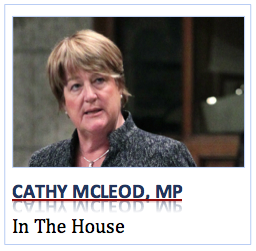 Cathy McLeod – The one person who really should not volunteer an opinion on this issue. To have been part of the previous government in power, that absolutely refused to launch a National Inquiry into Missing and Murdered Indigenous Women at all, and then a few years later complain about the failings of this one as a tragedy, a betrayal and a massive offence … is hypocritical at best and at worst openly duplicitous. If you personally thought it was a good idea back then, why did you not stand up to Harper and say so? Saying that all parties support it now, does not relieve you of the responsibility of when you were actually responsible. Do not assume that people forget. Well said, and I agree with you. Cathy needs to resign, she is not relevant at all.